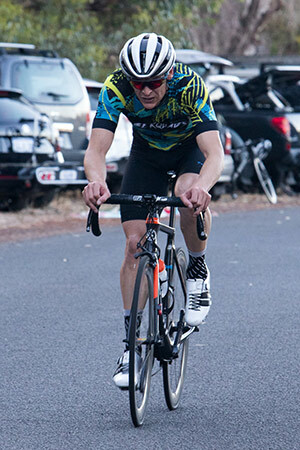 C grade was a very entertaining race (at least for the spectators) with two Peel riders constantly attacking. One rider would attack, the bunch would chase, catch the first rider, then the second rider would attack and the bunch was chasing again. When they caught the second rider, there might be a brief lull before the first rider attacked again. Despite all the attacks, no rider got away. The fast pace took it’s toll, with a number of riders being dropped, leaving 6 riders to contest the sprint finish. With Lyndon Miles first, Matt McCarthy second and Oisin McGrath third. B grade saw two riders attack on the first lap, get away and stay away for two laps. Before the chasing bunch caught them and a counter attack saw three riders get away. 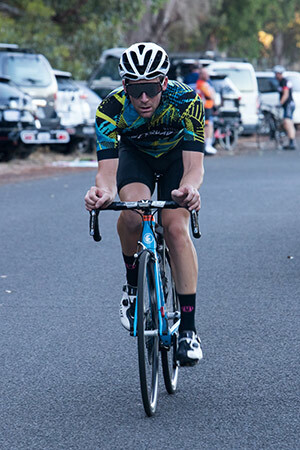 The trio built up a good lead, before splintering with Franz Nan Zyl, taking the win, with Michael Polmear second and Brian Johnson managing to stay away from the chasing bunch for third. The first 15 minutes of A grade were frantic, with attacks, counter attacks and riders getting dropped. Then there was a break of four, with a lone chaser caught in no mans land and the remains of the bunch no far behind. The four worked hard to maintain the lead and stayed away until the end. With Tony Doherty powering away from his companions to take the win, chased all the way to the line by Lowen Ferry, who claimed second, with Nicholas Lawler third.